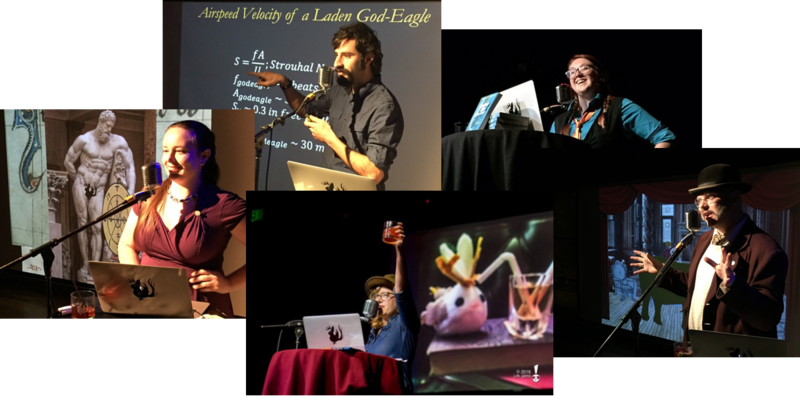 Odd Salon is an independent community project dedicated to finding and sharing stories from the odd corners of history, science, art, and adventure. We bring experts and enthusiastic amateurs together to tell strange-but-true tales live on stage, from legends of lost cities to masters of art forgery, engineering failures to murderous sideshow performers, daring heists, questionable taxidermy, and tales of epic revenge. We host regularly scheduled cocktail hour lectures twice monthly at Public Works in San Francisco, occasionally elsewhere. We're here on Patreon because over the last four years we have realized that this little project of ours has grown and evolved, and now we are looking at what we can do next to find and share more odd stories, expand our reach beyond our San Francisco salons, create tools and resources for tellers of true tales, and support this growing community of curious minds. This project has been (and continues to be) a labor of love, made of optimism, a shared love of the strange, and managed by a small team powered by a truly staggering quantity of tea. We have the absolute best community who have brought their skills and labor to the table, shared their expertise, made the microphone stop making that one noise, mentored new speakers, and photographed and recorded hundreds of hours of talks. We have sold, one at a time, tickets and glassware, stickers and patches, t-shirts and tiny stuffed Wolpertingers to make this thing go. And we’ve made it this far. This is a ridiculously expensive city to try and do odd independent projects, but we think it’s worth it. And we want to do more, together. If a story on our stage ever ignited your curiosity to learn more…. Please consider joining us as a patron. Your support here brings much needed stability to this labor of love, and gives us the means to continue sharing more stories, pulling treasures from our not-inconsiderable archives, and providing training, mentorship and tools for the storytellers in our community of odd minds. We need to buy a lot more tea. "Odd Salon is for the curious, the ones who peek around corners, explore on weekends, remove their earbuds and open their eyes to observe and listen during their commute. For individuals who, no matter what they do during the day, want to spend their precious free time communing with other curious people, in a room filled with oddities and curse words. For people who enjoy being surprised and shocked and like to laugh, no matter where you’re from or how you pay your (astronomical) rent." ~Regular releases from our archive of resources for independent researchers, tools and structures of storycraft, and practical techniques for telling tales live. Support our workshops, outreach, and tools for our community of speakers. Support more odd videos and/or podcasts - Help us bank editing time to release more stories from the archives, and work on bringing new odd tales to a larger audience. Underwriting new odd endeavors: For the true patrons of the odd arts out there. ~A special monthly digital digest of treasures from the Oddlings and archives (compiled stories from our favorite Odd Salon stories, arcana from vintage sources, interviews, and artwork, and other odd delights). Keep on saloning, here in one of the most expensive places on Earth. Your support means we can continue keeping San Francisco odd with our local live salons and strange tales from history, teaching the arts and craft of storytelling, and fostering a community of curious minds.